Irish Girl meets Canadian boy. He has a band, she has a blog.... they both live in Korea now. 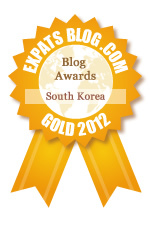 ExpatsBlog.com Expat Blog Awards 2012: Korea South Gold Award! This blog won the Gold Award for best expat blog in Korea South! What can I say? This blog puts a smile on my face whenever I stop by for a gawk. As a teacher, Quote Friday is a highlight - always good for a chuckle! Tuesday Timewasters is an invaluable resource for an amateur procrastinator like myself (am thinking of going pro soon). I'm sure if could cook I'd find Cooking in Korea just as useful. Perhaps the best thing about this blog is the writing - funny, lively and always engaging. Almost makes me wish I were in Korea myself. Keep it up! My time is extremely valuable; I don't have time to read mere blogs. But I find the time to visit the Ketchup War throughout the week. Cat Week was awesome. Check this shiz out now! I'm not one for blogs usually but The Ketchup War keeps pulling me in! We share a common interest in Timewasting! I also enjoying reading The Ketchup War's hilarious take on living and teaching in Korea. Perhaps my favorite part is Quote Fridays. I wish my kids were half as entertaining!!! This blog has a great sense of humor and high energy posts about everything under the sun. Some blogs are too limited in scope to only food in Korea, etc. but this one has just enough of the informative posts and great personal anecdotes. If you haven't read it yet, check it out! Quite simply the best blog I've ever read. Id have chosen 10 stars had you given me the choice. Love love LOVE this blog! Quote Friday is most certainly my favourite part, with everything else coming a very close second! Absolutely fantastic, as a teacher in Bangkok I can relate to quite a lot of the random contributions from her class! Has me in stitches, Quote Friday is definitely a highlight :) Love it, keep up the good work. This is a great blog!! It is one of my favorites! Every week I look forward to the hilarious quotes and timewasters. The cooking tips, and random stories are added bonuses! Funniest blog about expat living by far! Nothing comes close! This is a great blog... my favorite by far! Always look forward to Tuesdays and Fridays when I can read the blogs they make you forget about all your worries...best destressor you can have...keep it up. I love this blog! It's so hilarious and creative! Love reading it! Great blog! Love it! Hilarious and informative. I really like quote Fridays! Keep up the good work! It's great. The only bad thing I can say about this blog is that it makes me sad that my students aren't nearly as funny and interesting! Excellent work. Quote Friday is a joy and the personal articles give great insight into life in Korea. It makes me want to visit! Hilarious Korea stories -- You don't have to be an English teacher in Korea to appreciate this blog, but it sure doesn't hurt! So hilarious. Can't believe I haven't been reading this forever. The Ketchup War is a brilliant blog. I've lived in Asia myself so I really enjoy the hilarious anecdotes about Korean life. Tuesday Timewasters and Quotes Friday posts are also fantastic for entertainment whenever you've got some time to kill. Keep on rocking in the blog world!! Love it! Really love it! Can't stop reading the timewasters and quotes each week!